Why would your clients follow you? You're an accountant. (SPOILERS) A reasonably-sized hit stateside, probably because The Accountant has a flashy idea at its centre (an autistic hit man: whatever next?! ), if one foolhardily flirting with insensitive territory, is reasonably well executed (from journeyman director Gavin O’Connor, at least surrendering any faux-aspiration towards serious dramatics per Pride and Glory and Warrior), and stars Batfleck, perfectly cast as a remote, impersonal, impassive number-cruncher (emotional depth has never been Ben’s metier). If that sounds like faint praise, it is, since the picture is junk, but fitfully entertaining junk. Most of that fitfully entertaining part snaps into gear when Batfleck, as mild-mannered but socially-inverted accountant Christian Wolff, is out and about snapping necks and shooting villains more villainous than himself, equipped with firepower more fearsome than theirs (lest we forget, since he gets off scot free, he’s cooking the books for any criminal outfit that will employ him, although we’re clearly supposed to forgive, as he gives a lot of money to charity and informs the treasury department of the really bad eggs; this aspect has the whiff of a script conference note, rather than the germane behaviour of a high-functioning autistic). When O’Connor is concentrating on the action, which ups its ante further once Jon Bernthal’s assassin appears on the scene, The Accountant is a highly satisfying slayfest, especially so during Batfleck’s takedown of Bernthal’s entire squad during the finale. It’s elsewhere that the feature frequently stumbles and crumbles amid a litter of clichés and careless plotting. Wouldn’t you know it? The legit case Christian takes to avoid treasury scrutiny (a robotics company offering limb replacements) is nothing of the sort – making Ben something of an autistic killer accountant equivalent of Jessica Fletcher – since a criminal scheme has been hatched to up the profits of the company in anticipation of a public offering. And – wouldn’t you know it? – affable John Lithgow is actually an arch-villain, given to fevered, despotic rants immediately prior to batfleck putting a bullet in his head. And – wouldn’t you also know it? – there’s a love interest (Anna Kendrick) for Christian, although even screenwriter Bill Dubuque (formerly of the mostly sloppy The Judge) isn’t quite shameless enough to go there. For all that The Accountant is rudimentary in characterisation and plotting, it frequently lacks clarity with its villains’ scheme. Added to which, the subplot concerning JK Simmons’ treasury investigator and his protégé Marybeth Medina is strictly by-the-numbers, from her deductions (Christian’s aliases are all famous mathematicians, and will you look at those green-on-black super-sized internet articles on the subject letting us dummies know how she worked it out! ), to the photos of their target (all inconveniently of the back of his head), to his recounting how Batfleck let him live one fateful day. There are flashbacks that work well enough, however; those with Jeffrey Tambor mentoring Christian in prison are engaging because Tambor is engaging. And those of young Christian being taught to survive in a world that won’t care for him are eerily similar to those of Dexter (right down to there being a similarly psycho brother). Although, this aspect in itself is a tad dubious, since it parallels a high-functioning autistic with a high-functioning serial killer. Tellingly, Ben’s younger self (Seth Lee) delivers a rather more impressive, punchily flailing performance than Ben himself (whose height of expressiveness is a wee wince when smacking his shin bones). I didn’t twig the twist regarding Bernthal being Batfleck’s brother before the person sitting next to me whispered it, although I did deduce the voice on the line was the grown-up daughter of the institute director who offered to help young Christian; frankly, I could have done without the bro-bonding of the final scene, although Bernthal can’t help but incrementally improve any movie he’s in. As for how responsible The Accountant is in its depiction of autism… Well, certainly, if you expect more from Hollywood movies than you ought, you’re bound to be disappointed. The makers are careful to make inclusive comments, such as viewing those diagnosed as leading different but no lesser lives, and considering normalcy a value judgement, but there’s a persistent sense that Chris’ place on the spectrum varies according to the demands of exposition or interaction (or gags: "I have a pocket protector") in the given scene. Some have said it’s cool that those with autism get a hero of their own… Sure, in the same way Harry Callahan’s a fine role model for budding sociopaths, I guess. 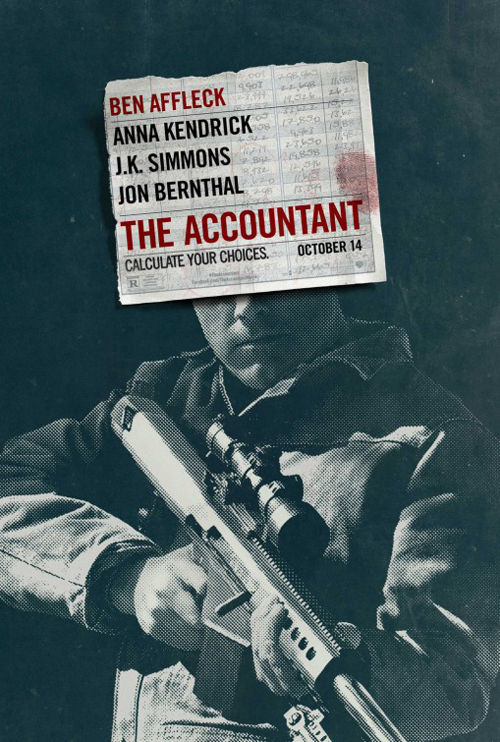 The Accountant’s a picture that essentially excuses a father for turning his sons into ice-cold killers, since at least they’re socially-enabled ice-cold killers (at least they have jobs!) It’s also as unsuccessful in making accountancy appealing as Jack Ryan: Shadow Recruit was in promoting the role of compliance officers (about the most exciting thing we learn of the trade is that when auditors scrawl notes across doors, walls and windows, they’re considerate enough to use dry-erase markers). But with an additional appreciation for Jackson Pollock, which may make it even more of a disappointment.